Founded in 1967, the Israeli company Elbit Systems has become one of the world’s premiere “security and defence,” firms, specializing in military electronics, surveillance systems, Unmanned Air Vehicles (UAVs or “drones”), and security systems. It is a symbol for the Israeli economy, which essentially thrives on and fuels war, repression and control in Palestine and around the globe. Elbit Systems is built on the expertise of the Israeli Ministry of Defense Research Institute and has profited greatly from supplying the Israeli military with a variety of equipment used to sustain Israeli occupation of the Palestinian people. It produces the drones used in the wars and attacks against Gaza and Lebanon and provides equipment for the Israeli Merkava tanks. The Israeli Apartheid Wall, which is crippling Palestinian communities by isolating them in walled-in ghettos, has provided a massive source of revenue for Elbit. Elbit Systems provides “intrusion detection systems” for the Wall, in particular around Jerusalem. Subsidiaries Elbit Electro-Optics (El-Op) and Elbit Security Systems supplied and incorporated LORROS surveillance cameras in the Ariel settlement section as well as around Ar Ram. One product made by Elbit Systems, “Torch”, is manufactured specifically for use on the Wall. Elbit offers its experience in ghettoizing and killing Palestinians to repress other people. In 2006 its American subsidiary Kollsman Inc. won a contract to participate in the creation of the US – Mexico border wall, dubbed by activists the ‘Wall of Death’. On June 9th 2004, the International Court of Justice ruling on the legal consequences of the Wall not only confirmed the illegality of the Wall under international law, but also insisted that all state parties to the Fourth Geneva Convention are obligated “to ensure compliance by Israel with international humanitarian law” and thus “not render any aid or assistance in maintaining the situation created by [the construction of the Wall]”. Thus, actors who aid Israel in the construction of the Wall are, by association, in breach of international law, including, as the ICJ ruling highlights, the United Nations Charter, international humanitarian law and human rights law. Many international financial institutions and pension funds have additional ethical guidelines or are part of international human rights frameworks, such as the UN Global Compact, which include provisions against complicity with human rights violations and war crimes. Because Elbit Systems is knowingly participating in and aiding Israeli war crimes and Israeli occupation of the Palestinian people, investors in and partners of the security firm are, by extension, accessories to Israel’s many violations of international law and human rights standards. Grassroots movements and campaigners have raised awareness of this relationship and several pension funds and financial institutions have pulled their investments from Elbit. The world is becoming increasingly unwilling to bankroll Israeli war crimes. Since the launch of the BDS campaign in 2005 on the first anniversary of the ICJ ruling against the Wall, the BDS movement has made huge strides in raising awareness about the central role international support plays in sustaining Israeli apartheid. The campaign against Elbit Systems has had numerous successes and has become a key pillar of the BDS movement. In May 2010, Deutsche Bank, Germany’s biggest bank, announced it was ‘out of Elbit’ and confirmed exclusion of the company from its portfolio because it does not meet Deutsche Bank’s ethical standards. Deutsche Bank was previously listed among the top ten investors in the corporation. Scandinavian countries have been leading the divestment movement. On March 29th, 2010, the administrators of Sweden’s national pension funds announced that they were excluding Elbit Systems from their investment portfolios. Shares in Elbit fell by 3 percent in the days that immediately followed the Swedish announcement. Curiously, Israel’s response to the Swedish funds was surprisingly weak, only stating that it was a “regrettable” decision. This muted reaction suggests that Israel is struggling to find an effective way to counter the BDS movement’s rapidly growing momentum. AP’s refusal to be complicit in Israel’s human rights abuses follows a trend started by Norway in 2009 when the Norwegian Finance Minister announced that the state pension fund was to become the first major fund to divest from Elbit because of its connections to violations of human rights and international law. * September 2009: Norwegian State Pension Fund divests. January 2010: Danwatch, the Danish financial watchdog adds Elbit to its blacklist of 35 companies that are disqualified from investments due to ethical considerations. February 2010: Folksam, Sweden’s largest asset manager, responds to an inquiry regarding its investments in either Elbit or Africa-Israel, that the fund did not have holdings in either company. Folksam’s Head of Corporate Governance, Carina Lundberg Markow, writes to The Electronic Intifada: “We have a strict policy regarding activity on occupied land.” She notes that KPA Pension, a leading Swedish pension company in the public sector, also did not have holdings with either Elbit or Africa-Israel. February 2010: ABP sells Elbit shares worth 2.7 million dollars. March 2010: The First, Second, Third and Fourth Swedish National Pension Fund (AP1, AP2, AP3 and AP4) decide to exclude Elbit Systems from their investments. May 2010: Deutsche Bank announces the exclusion of Elbit from its investments. 2013: RMIT University in Melbourne, Australia, launched a campaign against both BAE and ELbit Systems. The university receives funding, performing postgraduate research. 2013: Grassroots International launched a campaign against TIAA-CREF to divest from Elbit Systems, as part of a broader worldwide effort against large pension funds and banks. April 2014: graduate students at the University of New Mexcio in Albuqeurque, United States, passed a resolution calling for divestment from the companies profiting from human rights violations in occupied Palestine and at the US-Mexico border. The resolution specically targeted Elbit Systems following the company securing a contract with the US government to further militarise the US-Mexico border wall. May 2014: As a result of Elbit’s contract with the government of Rio Grande do Sul, Brazil, to build a military microsatellite, protesters blocked the office of Elbit’s subsidiary AEL Sistemas. The protest aimed at putting pressure on both local government and university to divest from Elbit. The following points, drawn from the victories in the campaign to divest from Elbit as well as other important BDS victories against Lev Leviev and companies Veolia and Alstom, may be helpful when choosing a company to target for divestment. 1. The first step is: Discovering investments in, cooperation with and other support to Elbit. Many other smaller investors are not listed. It will be up to you to investigate whether a specific pension or investment fund holds investments in Elbit. Banks and public funds, universities, unions and churches have often an obligation to disclose their investments. It is not easy to find out about contracts in the field of arms trade and homeland security – especially not before they are awared. 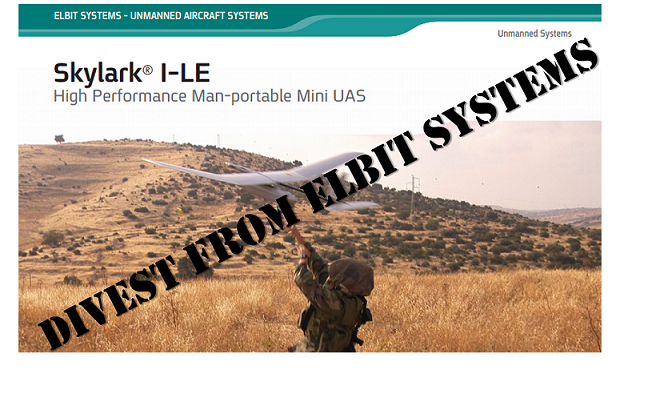 Elbit lists some of its contracts on its site:http://ir.elbitsystems.com/phoenix.zhtml?c=61849&p=irol-news&nyo=0. Other contracts may be locally or nationally publicized. Even if the campaign is not strong enough to reverse done deals, a sustained effort can well stop any renewal of contracts. Example: Stop Australian Defence contracts with Elbit! Elbit Systems receives millions of dollars in research and development funding from government and third sector research programs that are financed with public tax money. This funding often contravenes rules prohibiting the use of such programs to fund military research. Details of such funding are usually made public, offering ample space for grassroots campaigns. Example: Stop EU funding for Elbit! In 2007, Israel became associated into the EU’s Seventh Research Framework Programme (FP7) 2007-2013, under the EU Agreement on Scientific and Technological cooperation and, as a result, Elbit qualifies to apply for EU funding. Elbit currently participates in research projects worth €14.19m, including taking the lead on a €8.99m project. Elbit has a range of subsidiaries, including Elbit Systems of America, Vision Systems International LLC (VSI), Elop, ESLC-T, Elisra, Cyclone Ltd, Elbit Security Systems Ltd. (ELSEC), Kinetics Ltd, Semi-Conductor Devices (SCD), Optronics Industries Ltd. (Opgal), UAV Tactical Systems Ltd. (U-TacS). Campaign against the contracts and investment in these subsidiaries! Example: Stop UK tax money boosting Elbit profits! International companies partner up with Elbit to make joint bids for big tenders or to develop new technology. Campaigns can target international companies and pressure them to look for different partners. Example: Stop German complicity with the Israeli war crimes and the Apartheid Wall! Both large and small investments have their benefits and drawbacks as campaign targets. While the loss of a large investment has the opportunity to make a more tangible effect on a corporate policy, larger investments make more difficult targets. The loss of smaller investments, while not making a huge financial dent, may be easier to effect and are still effective in raising awareness about Israeli apartheid and BDS and create spaces for future campaigns. Note that the size and importance of investments are always relative to the overall investments an institution holds and the availability of alternative investments. Many banks and funds have ethical guidelines or have made commitments to ethical standards such as the UN Global Compact. Elbit clearly violates international law, human rights and the basic principles of the UN Global Compact. Activists may choose to campaign for the adoption of some sort of binding ethical guidelines as a first step to divestment and this may be a good way to build alliances with other campaign groups interested in ethical investment. Some investment funds and banks are particularly conscious of their image as ethically responsible investors. They may have a history of divesting from unethical companies. The history of a financial institution can be useful in gauging the likely success of a campaign and can provide useful precedents. If a financial institution manages funds for a public or third sector body such as churches, trade unions or universities, these stakeholders may be sympathetic to the campaign and be able to provide additional pressure. International and human rights law can be a useful tool in divestment campaigns, both with state and government investments and pension funds as well as when targeting private institutions. The Apartheid Wall is being built in defiance of international and humanitarian law, and in disregard of the 2004 International Court of Justice (ICJ) decision. As such, companies in states that incorporate international law into their national legal system can be prosecuted in national courts. For example, Veolia and Alstom, two French multinationals are on trial in French courts for violations of international law through their involvement in the Jerusalem Light Rail system that aims to cement Israel’s hold on Occupied East Jerusalem. Tadiran Electronic Systems Ltd. and Tadiran Spectralink Ltd.
Elbit systems operates in Singapore and I suspect that the Singapore Government has invested heavily in Elbit as well. Singapore may be using its Pension a Funds via Temasek Holdings . Can I get someone to help me expose the se things publicly here in Singapore.